Holding many remarkable titles such as the “Queen City” and “Best Places to Live in the Northeast” by Money Magazine and Forbes, Manchester continuously appears favorably in rankings and lists for affordability and livability. Professionally and personally, the city is built to support growth and viability of business and family. Additionally, Manchester is home to nearly one third of the New Hampshire population, and due to its pristine location, it is easy to understand why! What’s Near Manchester, New Hampshire? Situated on the banks of the Merrimack River, the city of Manchester is naturally divided into its eastern and western regions by the geographical climate. The natural beauty within the city is balanced by the incredible economic growth of the community. Holding the title of New England’s second largest city behind Boston, MA, Manchester continues to grow and prosper in business and fortitude. Located nearby, one has access to the Manchester Airport, Southern New Hampshire University Arena and a diverse, but expanding array of new restaurants, shopping at the Mall of New Hampshire just minutes from downtown Manchester. The quality of life that is available in Manchester is unsurpassed. Tax-free New Hampshire is a hub of entrepreneurs and growing families looking for a place to thrive in all aspects of their daily lives. Built in and around the natural scenery, Manchester is home to an urban feel with an unstifled panoramic view. With a lively city scene, many residents also enjoy retreating to the countryside for views of the Merrimack River or head into the White Mountains, lying about an hour to the north. Prefer the marine views? The Atlantic coastline is not too far away, where you can enjoy miles of the New Hampshire beachy shoreline. The urban feel is also popular, and many from the Manchester community frequent their own city, but also enjoy the close access to Boston, MA for another vibrant adventure! Close to urban life also means close to incredible educational facilities. The area boasts a large student population ranging in university backgrounds of Harvard, MIT, Northeastern, Boston College and the University of New Hampshire. Additionally, South Willow Street (just a ten minute drive!) is home to a plethora of restaurants ranging in fast food to casual dining and premier steak houses. The fun does not stop there! Manchester, New Hampshire also is a proud home to a beautiful arts and entertainment culture. Home to the Palace Theatre and the Currier Museum of Art, these internationally recognized locations are only the beginning of the fine arts facilities hosted by the city. Looking for a day trip with the little ones? The See Science Center offers a perfect day trip where learning and fun go hand-in-hand! Enjoy the convenience of the city in a cozy country setting at Woodedge Estates. 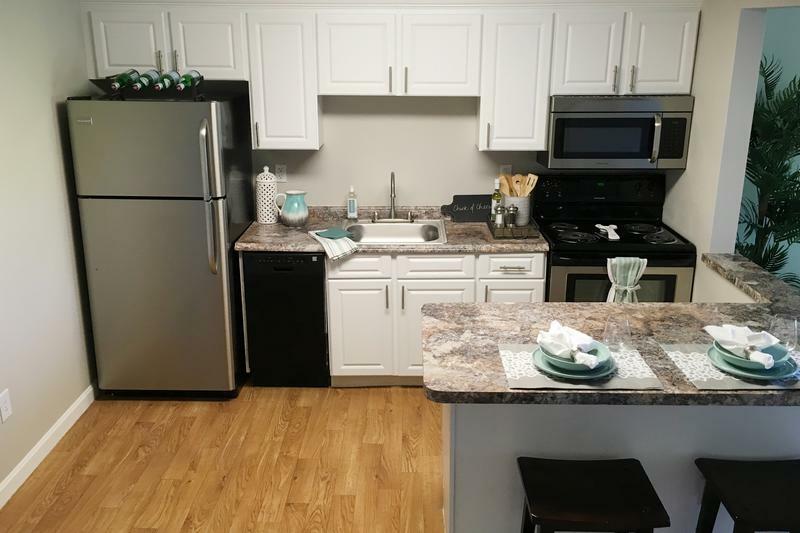 Our apartments in Manchester, NH feature one bedroom, two bedroom and studio floor plans that offer generous closet and cabinet space, plush carpeting, newly renovated and fully-applianced kitchens, as well as private patios or balconies with select floor plans. Our Manchester, New Hampshire apartments for rent feature first floor laundry facilities for your convenience and on-site professional management and maintenance staff that are always available to you! There is even a convenience store right across the street from our neighborhood in case you need anything from milk and bread to dish soap and coffee! We’re committed to making you feel right at home from the moment you, your family and your pets move in. That’s right! We offer pet friendly apartments in Manchester, New Hampshire and we even offer pet stations on the grounds throughout our community – we know it just would not feel like home without them! When you’re looking for something to do, you’re welcome to play at our basketball and volleyball court. For the kiddos we have a playground and a picnic and grilling area for families to enjoy whenever they’d like. Woodedge Estates offers country living with city convenience. Call one of our remarkable leasing staff members today to schedule a tour of our beautiful community and experience what it is like to live with the Aspen difference at our apartments in Manchester, NH!